Chronicling a legend is a daunting task. You don’t want to disappoint your audience, but you also want to portray a life in all of its complexity. Michael J. Mooney in The Life and Legend of Chris Kyle performs admirably but often succumbs to hero worship. His Chris Kyle is all legend, all super man. Kyle’s legend was founded in his being one of the greatest Navy SEAL snipers ever. Mooney tells this aspect of the story splendidly. The story of Kyle shooting potential car-hijackers may sound like a television drama, but it’s cold fact. The most lasting part of Kyle’s legend is his work with Iraq and Afghanistan veterans, helping them adjust to life after war. After dodging countless bullets in conflict, the one with his name on it was fired by one of the very vets he sought to help recover. The kid born in West Texas appeared to be destined to be the "Devil of Ramadi." Kyle was a chivalrous gunslinger who, even as an adolescent, followed his strong convictions and sense of blunt honesty. Mooney portrays Kyle as being ready-made for the SEALS from the second he appeared out of the womb. The only career that would combine his fearlessness with his love for country was as a special operator. The U.S. military embraced Kyle’s brashness. He was one of the most disciplined warriors on the battlefield but knew how to relax while off the clock. This most lethal killer unwound by playing video games with his brothers. Kyle would enter kill zones without his issued Kevlar helmet, wearing his worn-out Texas Longhorn ball cap. Mooney also trumpets Kyle’s values as a father and husband. Kyle’s widow, Taya, is mentioned throughout as the anchor settling the restless hero. However, the couple ran into difficulty once he had no more battles left to fight. Mooney merely hints at the discord the Kyles endured as the warrior returned to civilian life. It’s comforting to know Kyle found his place in society as a contractor post-combat, but not all warriors are as fortunate. Ask veterans and they’ll agree the return to civilian life is among the their greatest challenges. They’ll brush past their time in combat and instead laud their family. Mooney skips over Kyle’s post-war progress in order to show how Taya grounded Kyle. Surely there were complications on the way, complications that would give us a better understanding of this amazing man. The reader can’t help thinking that if Kyle still was here, he would say this book was a little too simple. 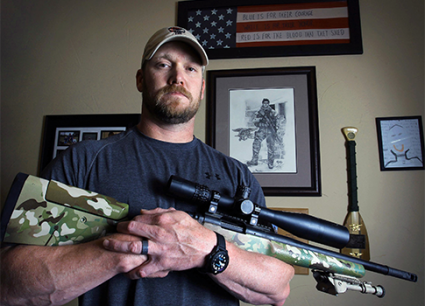 We’re still waiting for a portrait of Chris Kyle that shows him in all of his complexity.